Is Sebum Good For Hair? Why Is A Pre Shampoo Treatment Used As A Sebum Replacement? Sebum is a natural oil that helps to sustain the quality of hair, and is often regarded as nature’s ultimate conditioner, while also helping to protect each hair strand. Produced and secreted by the sebaceous glands located all over the scalp (and body), Sebum is then transported from the hair follicles at the root of the hair, all the way down through the hair shaft at a slow rate. The key function of sebum for hair and hair care, is its ability to condition and protect our natural hair, keeping it soft, easy to manage and protected from the environment. Sebum oil is often referred to as “grease”, and is considered a nuisance by most. However, many fail to realise the true importance of it for hair care, not to mention the lessons that can be learnt from the production of sebum, especially when applied to our daily hair routines. So we understand that the purpose of Sebum is to condition and protect our natural hair, but how does it know how much to produce? The body does well at working out how much Sebum is required dependant upon the individual and their needs. But, many people find that their hair can become greasy quickly, typically within 24-48 hours of washing hair. Unfortunately this is down to overactive sebaceous glands, producing excess sebum. How does a sebaceous gland become overactive? Well, there are many factors both internally and externally that can affect this, but the number one cause for overactive sebaceous glands on the scalp, is excessive hair washing! We all know and understand the importance of cleanliness but when it comes to hair care, it’s a different story. Each time you wash your hair, you’re washing away your natural sebum oil. Therefore our body responds by producing more to protect the ‘clean’ hair. If you wash your hair daily have you found that your hair becomes ‘greasy’ quickly, and perhaps more oily than those who only wash their hair once or twice a week? Well, that’s because your body over produces sebum to protect your hair, due to you washing it away daily. YES YES YES! Although many consider sebum to be an inconvenience, sebum truly does benefit the quality, texture and appearance of your hair. The role of sebum is to keep hair conditioned and with our tendency to over wash our hair, often our natural hair sebum is not able to journey down the whole hair shaft. This is why many of us experience dry, brittle ends. If we were to let the Sebum travel to the tips of the hair, the role of sebum would be extended right the way through your precious tresses, and the benefits would be even more apparent. Unfortunately for most, this is not an option, as allowing our hair to become greasy to the point that it covers the entire head of hair is simply unthinkable…fortunately we have the answer! A combination of natural and organic hair oils, to restore and condition dry hair. FREE Worldwide Shipping! Now in relation to hair extensions, the reasons these often become dry, knotted, matted and obvious to the eye, is because they receive no natural hair sebum to help protect and condition them. So what can you do to keep not only your own hair but also your hair extensions in the very best, healthy condition? The answer is an all natural pre shampoo treatment, that can replenish both natural hair and hair extensions in the same way and more than sebum does. This treatment will provide you with luscious, luxurious, soft and shiny hair that everyone will be envious of. Why Is a Pre-Shampoo Treatment Used As A Sebum Replacement? An all natural pre shampoo treatment is perfect for those looking for a sebum hair treatment without having to allow their hair to become uncomfortably greasy. You’ll be able to rid your dry, dull, lifeless hair woes with this nourishing treatment. This style of treatment is applied to dry hair so it can soak into the hair shaft, much like sebum does when naturally produced from the scalp. The pre shampoo is then left, preferably overnight, to condition the hair, before it is washed out in the morning with your usual shampoo and conditioner. If you don’t have the opportunity to leave the treatment in overnight, then you can leave it on for thirty to sixty minutes, and follow with washing your hair. Using this specialist designed pre shampoo as a sebum hair treatment, permits you to condition the full length of your hair overnight. Allowing your locks to benefit from soaking up all of the beautiful natural oils contained within the formula. natural fragrance immerse your senses for a truly relaxing time. So what are you waiting for? 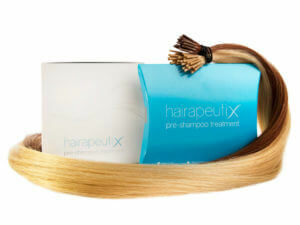 Get your hands on our pre shampoo treatment today and wave goodbye to those bad hair days! Available in 2 sizes, an all natural and organic intensive conditioning treatment. Suitable for all hair types (including hair extensions).